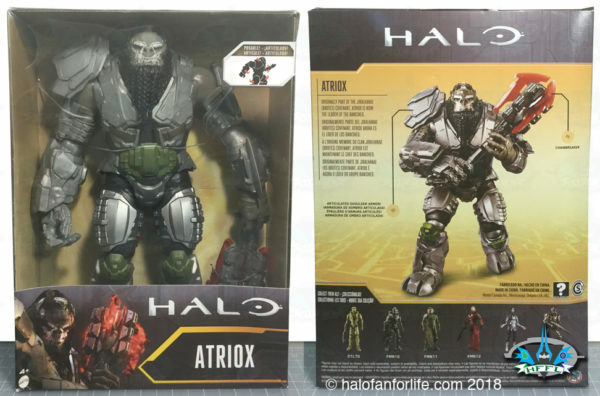 Atriox comes is a much wider box than the standard 12 inch Mattel figures. Several of the other figures are shown on the back of the box. 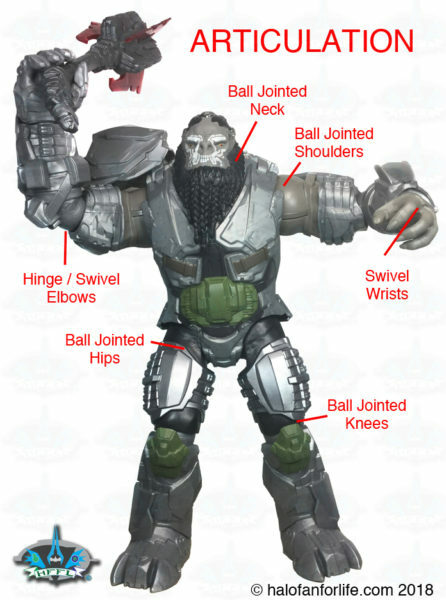 The gravity mace is being held in his left hand and is slightly obscured by the packaging. Here’s Atriox with his gravity mace. These are all the contents of the box. 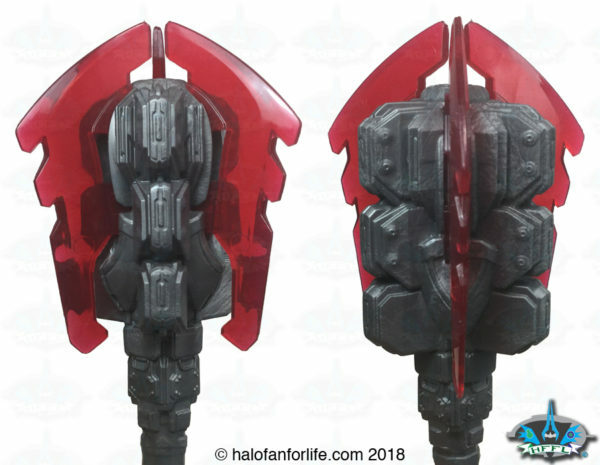 Sculpt details of Atriox’s head are good. I’m glad Mattel got the face paint on the figure. My slight disappointment here is how the eyes were done. Instead of orange, they should be red. I’m going to go back and repaint much of this figure. When I do, I’ll add in proper eye color as well as darken the recesses around the eye to aid in depth perception, while looking at the figure. Here we see Atriox in orthogonal views. 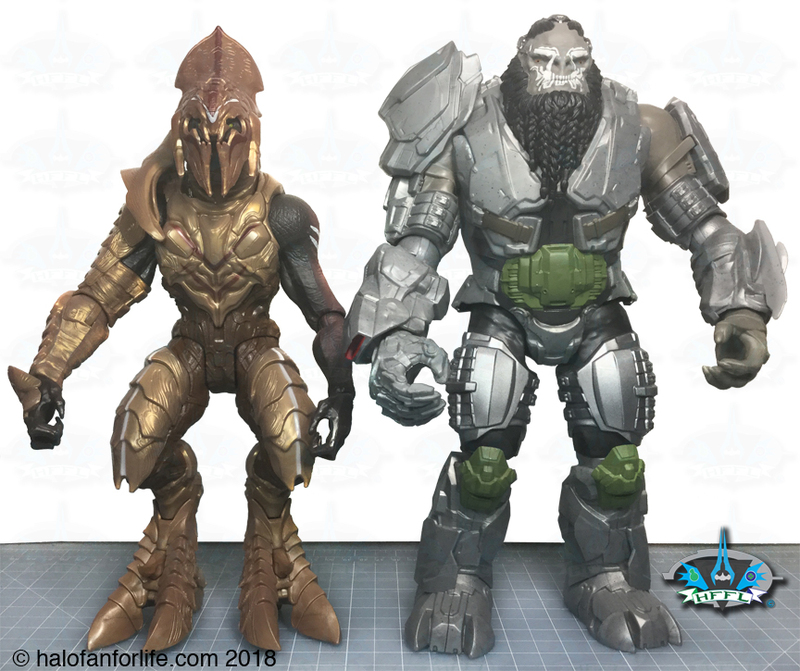 Other than the Arbiter, Atriox is very close to correct proportion when compared to all the other Mattel 12 inch figures. 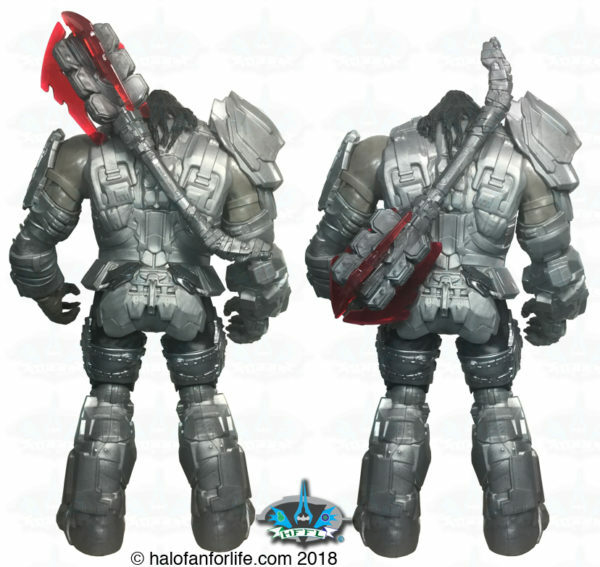 The back should have a more bulk, while his left shoulder armor should not be as flat. 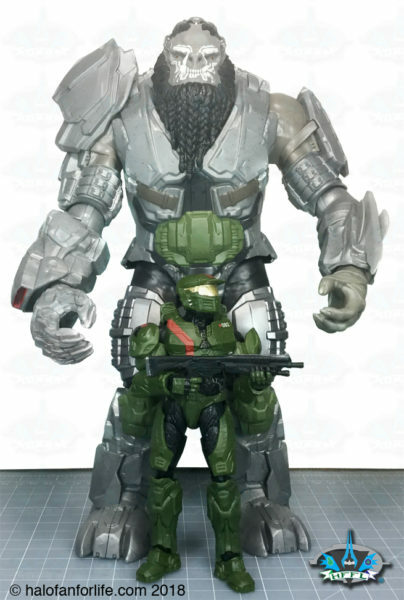 Still, the proportion as stated is much better than all but the 12 inch Arbiter from Mattel’s line. Atriox’s mace, Chainbreaker, is very well done. I especially like that the blades are translucent. (But you long time readers already knew I would say that, huh? LOL) I’d have liked the straps to have been painted correctly. However, as this figure is only $15, I’m fine with less paint application to keep the toy affordable. I also would have liked to have seen the mace have a hole for a pin, instead of the rod sticking out of it. That’s a minor issue though and can easily be overlooked. Views from a couple of sides of the top of the mace. Lots of great detail going on there. 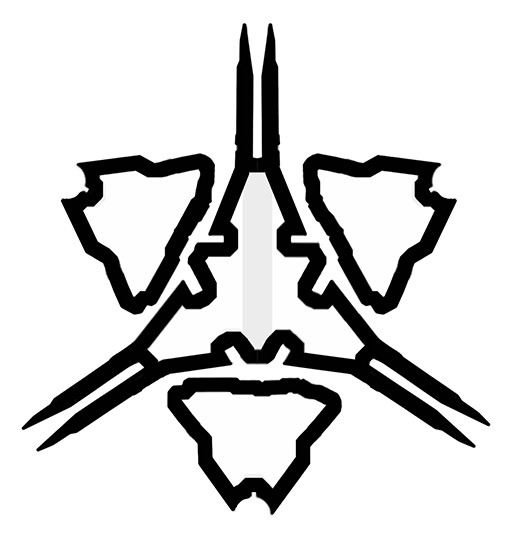 A view of the top of the mace reflects the Banished logo (as seen below)! Atriox has the standard articulation that all (save the Arbiter) 12 inch Mattel figures have. Additionally, his right shoulder armor is able to pivot up and down. 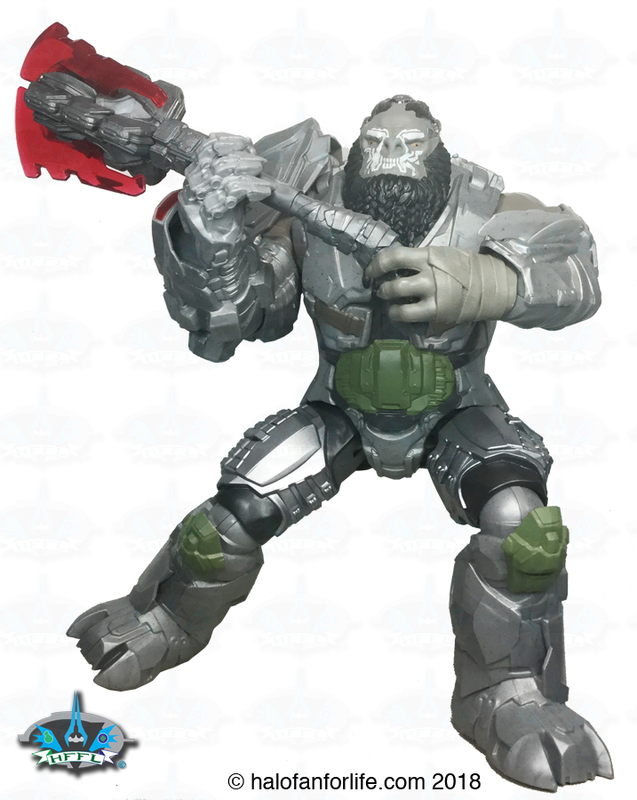 Atriox can hold his mace quite easily in one or two hands. 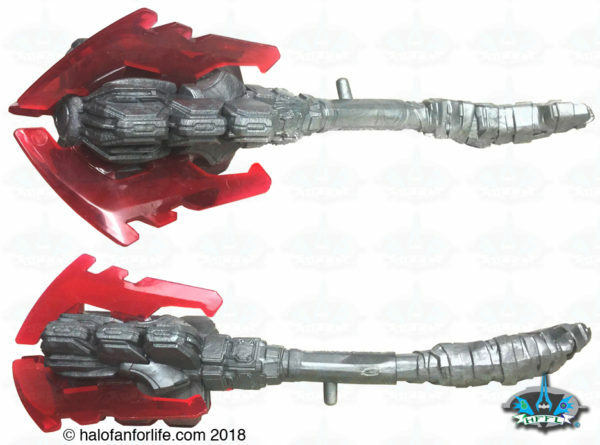 The rod that protrudes from the mace allows it to be inserted into a hole in Atriox’s back for storage. As you can see, you can put it into a couple different positions. Here we see a comparison of the 12 inch Atriox and 6 inch Jerome. 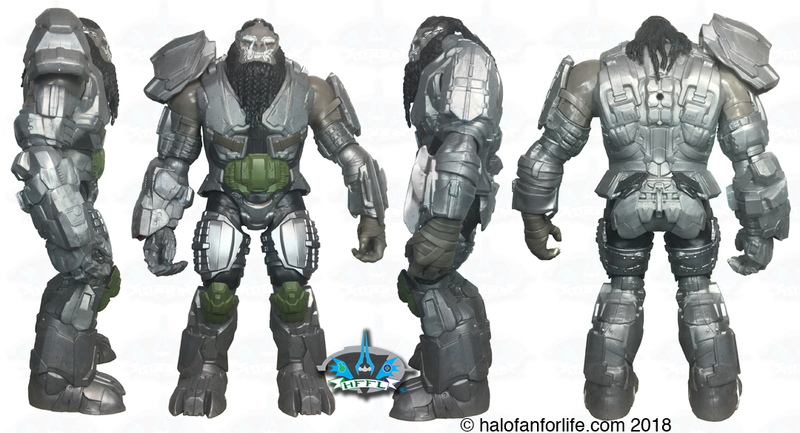 The large ODST chest plate at Atriox’s waist is a give away that the scaling isn’t in proportion. Still, I wanted to show this as I thought it was a cool comparison. Here’s a comparison of the 12 inch Arbiter and Atriox. I’m glad that Mattel got the scale height correct here. 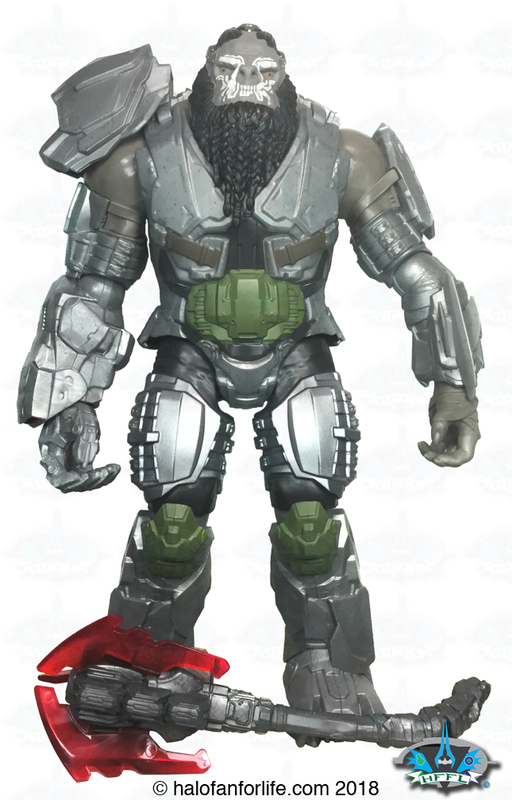 Atriox is indeed an imposing character! Overall: 42 medals out of a total 50 medals. Affordability here is KEY. Do I recommend this product? Yes. Atriox is a great named villain in Halo. The sheer size of the toy and that it’s only $15 makes this a purchase well worth it! The photo collage below is from @JoeGoodberry. 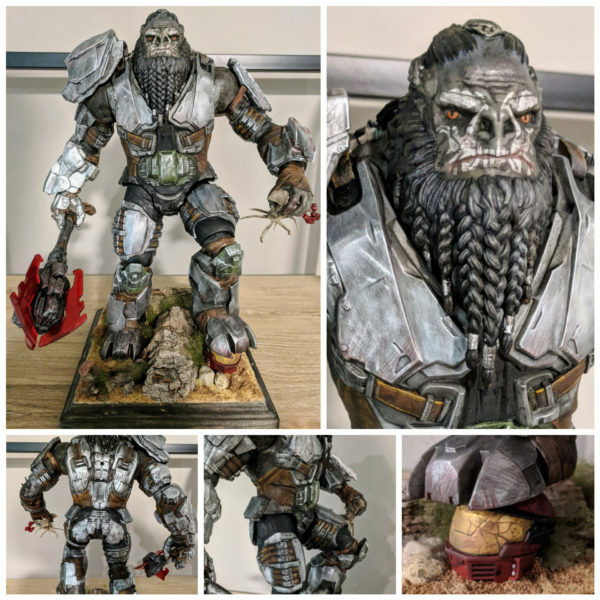 I wanted share this to show just how much better the figures can be with a full on paint job. And yes, it’s the same figure! 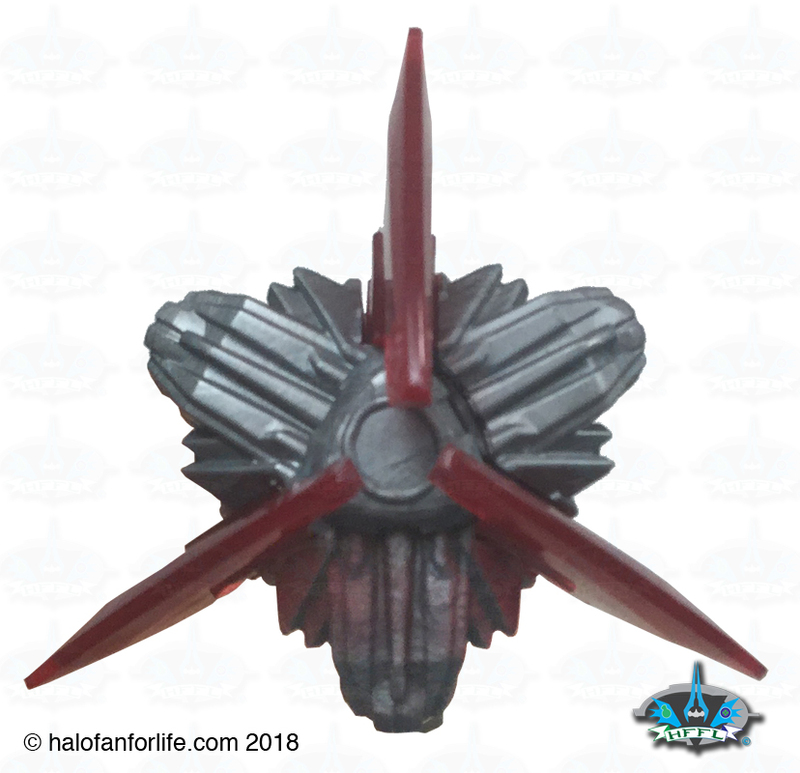 Again, keep in mind that if we got THIS kind of detailed paint application, the figure wouldn’t cost just $15. It would definitely be more in the $40-60 range. (And IMO, would be worth it!) Problem is, big box brick and mortar stores rarely carry higher end/priced collectibles these days. Not saying they don’t but it’s much more rare than it used to be, especially with Toy R Us being closed down.